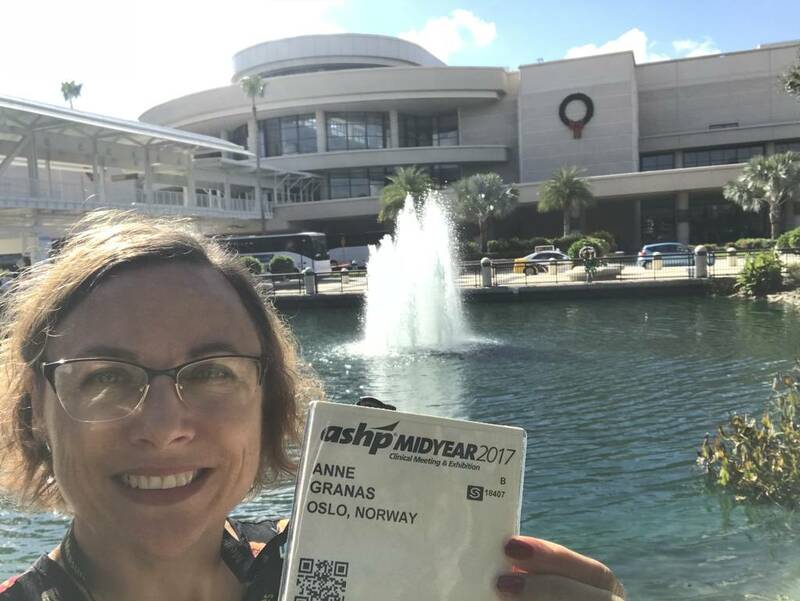 As a Fulbright Scholar in the USA in 2017/18, I was eager and at the same time terrified to visit the American Society of Health-System Pharmacists (ASHP) Midyear meeting in December 2017 in Orlando, Florida. 25,000 participants annually attends this meeting. I was there to learn more about Medication errors and Medication Management Systems in the USA. With Former First Lady Michelle Obama at the opening ceremony, I also experienced the semi-royal role the president family has. Her passion for health and physical activity was impressive, but also controversial. As a professional organization ASHP represent the interests of pharmacists practicing in hospitals, health maintenance organizations, long-term care facilities, home care, and other components of health care. About one-third of participants are final year pharmacy students and newly graduates, seeking residency placements in hospitals across the country. The majority of participants work in hospitals. Former First Lady Michelle Obama kicked off the Midyear meeting at the Opening Session. She spoke passionately about the need of healthy diets and physical activity in children. Obesity and diabetes cause enormous public health challenges. Obama encouraged the participants to be compassionate, to assume the best in others and to understand those one might disagree with. She congratulated pharmacists for the work they do on the ground in their communities. She also spoke warmly of emancipation and that women must strengthen their positions in executive boards and with decision-making powers. Her clear point of view received mixed response in the audience. The debate on Public Health Policies vs. commercialism of health and business interests creates frictions that are nearly impossible to comprehend from a Norwegian and European perspective. My main objective for attending this conference was to study systems used for Medicines Management and Medication errors. The hospital pharmacy sector at ASHP has become a bit of a nirvana for fans of high-tech digital software and hardware. I truly enjoyed the display of the newest robots, production support systems and medicine dispensing cabinets. Screens displaying patient medical records, up-to-date clinical patient information and integrated prescribing support systems were truly impressive. The future of hospital pharmacy is certainly digital. So much to absorb and bring home for future research projects in Norway! Pharmacy students in the USA who wants to pursue a career in hospital pharmacy are expected to work as a resident, i.e. attend a trainee program, for 1-2 years after graduation from university. There are however, more graduates than there are actual hospital placements, so competition is tough. But how do you organize thousands of pharmacy students seeking postgraduate residency positions in hospitals with numerous employers? The answer is speed dating! Students and residents dressed in their finest clothing, with CVs in their hands, carried out countless intense interviews with potential employers all over the Orange County Convention Centre. Could this setup between pharmacy students and employers be something “Farmasidagene” should consider? Have you ever been hanging around your conference poster for hours on end? Well, the AHSP has a different approach. Students and residents presented hundreds of posters in one-hour poster slots. From a participant’s point of view, this was an effective way to get an impression of cutting-edge projects and research. The topics typically reflected development of hospital pharmacy services, ambulatory care, anticoagulation, drug use evaluation, pain management, pharmacoeconomics etc. It was a bit hectic at times to maneuver between the poster boards and the large crowds, but discussions of the many innovative projects made the poster exhibitions fun and inspiring to attend. Rather nervous I waited “alone” for the shuttle bus to the Universal Studio with thousands of other participants. I got chatting to four young pharmacy students and discovered that two of them are exchange students to Europe to one of my “ESCP-friends”. It is a small world, and this common friend meant that I was “adopted” for the evening to join the lovely students at Universal studios. It is never fun to visit the Harry Potter world alone, but my new friendships made this ASHP evening truly epic. The proof of a good conference is whether you would go back, or not. The answer is yes, I would go back to another AHSP meeting. The workshops, lectures, exhibitions, posters and organization of the meeting were a success. However, the size of the meeting in itself is daunting, so next time I would bring a few friends. Do you want to join? Read more about ASHP at www.ashp.org.